Summary (from Goodreads): When Suyana, Face of the United Amazonia Rainforest Confederation, secretly meets Ethan of the United States for a date that can solidify a relationship for the struggling UARC, the last thing she expects is an assassination attempt. Daniel, a teen runaway-turned-paparazzi out for his big break, witnesses the first shot hit Suyana, and before he can think about it, he jumps into the fray, telling himself it's not altruism, it's the scoop. Just like that, Suyana and Daniel are now in the game of Faces. And if they lose, they'll die. My Summary: Suyana is a representative of the United Amazonia Rainforest Confederation - known as a Face. Each country has their own Face - like a representative in the UN - and each Face is tasked with the representation and diplomatic responsibilities of their country. Anyone can be a Face ... as long as they look and act a certain way. When an attempt is made on Suyana's life, she only escapes thanks to Daniel Park. But she's not out of danger yet - there's someone out to get her, and they won't stop until they've succeeded. As Suyana and Daniel run for their lives, they discover that their "perfect system of government" may be hiding things that could mean the elimination of Faces and the deaths of anyone who stands in their way. 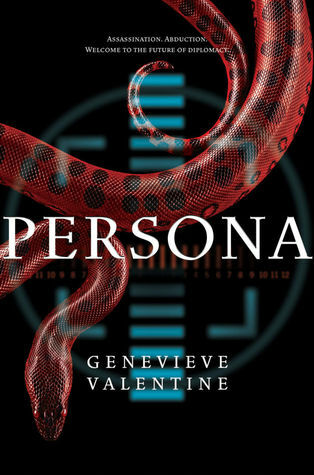 My Thoughts: I don't tend to read a lot of political thriller, but Genevieve Valentine has definitely made me want to start. This book was incredibly fast-paced and action-packed - it was full of intrigue and the amazingly varied settings had my mind reeling. I loved the elements of political suspense, and kept thinking that fans of the movie Taken would really enjoy this novel because I felt like they had a very similar atmosphere. Daniel and Suyana were great characters - each was extremely realistic, well-developed, and - like any interesting character - very, very flawed. I really enjoyed watching them grow closer as they ran for their lives (how else do you solidify a relationship?). The cast of characters had some great variety as well. The only thing I can say is that I wish we got to learn a little more about the implied government conspiracies, but all in all this was a very solid read that'll have me looking forward to more from Genevieve Valentine. Final Thoughts: I recommend this novel to fans of political thrillers as well as dystopian novels and sci-fi.